Strengthening our Community with your support. Edgewood is grateful to all the individuals who volunteer to make a difference for youth and families in San Francisco and San Mateo counties. We couldn’t do this work without you. Learn how you can volunteer to support our work with some of the opportunities below. Volunteers make a difference at Edgewood by giving time, talents, and hope to the families that we serve each year. 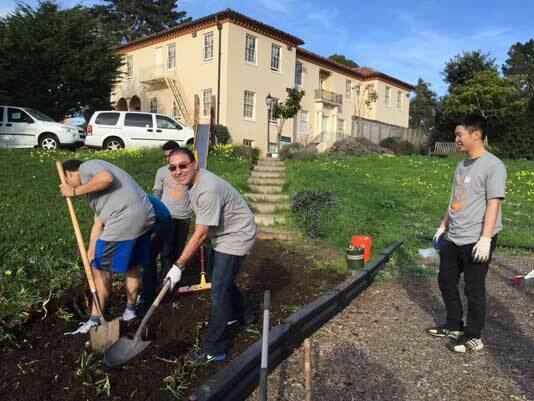 Our volunteers support Edgewood in both San Francisco and San Mateo through events, breakfast and dinner clubs, gardening, the food bank, annual Across the Bay 12K race, and more. Volunteer opportunities are available for mentoring, cooking, recreation, physical fitness, and gardening. If you’re interested in becoming a volunteer, please download our application and email it to kerik@edgewood.org. For more information, Please contact Keri Kirby, Manager of Philanthropic Services, kerik@edgewood.org or call (415) 682-3212. Edgewood hosts volunteer interns in several of our departments each year. This is a great opportunity to learn more about our work while developing essential professional skills to help you with your career.